Thanks to Mosquito Squad and The City of Richmond Tree Stewards, 20 new trees were planted on Arbor Day, April 26, 2013, in Union Hill. We made a little video about the event. Check it out and you'll learn a lot about the best way to plant a tree. On Arbor Day, Friday, April 26, 2013, Mosquito Squad, its two local franchises and its national Richmond headquarters staff, will be in Union Hill planting trees as part of their Arbor Day national day of service. They're helping restore the urban tree canopy in city neighborhoods devoid of trees. City of Richmond Department of Public Works has been restoring sidewalks in the physical heart of Union Hill, formerly blighted areas on Cedar Street, O Street, North 23rd Street, and North 24th Street. 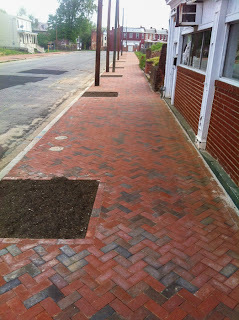 The City has left great tree wells for us to fill to make the new sidewalks comfortable, safe, and attractive. The improved sidewalks and trees will connect new businesses with our neighborhood and Church Hill House. UHCA Meeting April 17, 2013, 7pm. Join your neighbors for the next Union Hill Civic Association Meeting and make change happen in your neighborhood! We'll gather at 7pm at Johnson's Southern Comfort, 2306 Jefferson Avenue, between N. 23rd and E. Leigh Streets. Blue Sky Fund invites you to the 8th annual Church Hill Games! 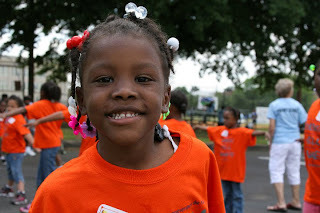 Church Hill Games (CHG) is a sports clinic for kids from K to 8th grades that will include 12 different sports stations. After the clinic, there is a Christian inspirational speaker and lunch. This year, we are expecting 250 kids, so we need lots of volunteers! Details: Volunteer registration deadline: April 29th, 2013CHG is on Saturday, May 11th from 9:30 am to 2 pm.CHG location: Bill Robinson Park in Church Hill, 701 North 37th St. Richmond, VAVolunteers must be in 9th grade or older. Children of volunteers in K–8th grade are encouraged to attend as a participant but cannot volunteer.